Melissa, I’m so sorry to hear this, but I’m glad your attitude and position in life are making it somewhat easier. 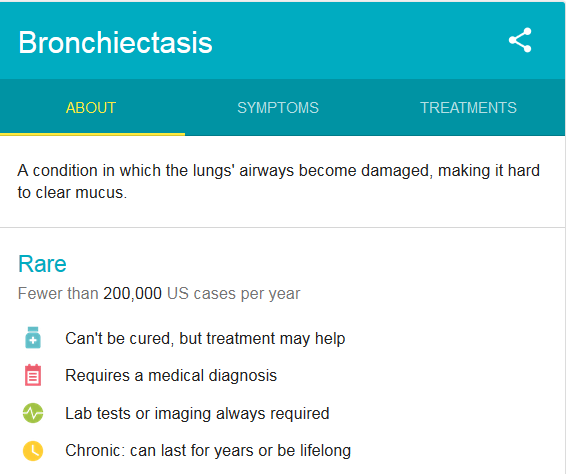 I looked up bronchiectasis, but I can’t say I fully comprehend what this must mean for you. Not being as fit as before must be hard, and having to have two sessions with the vest each day can’t be fun. But it sounds like you’re at a good place otherwise and you have the right attitude. That might make all the difference. Cured or not, I hope you get better. But more important: don’t let it drag you down. Thank you so much! Yeah I’m guilty of sharing a bunch of political stuff so I guess I deserved that. 😀 I am in a good place – I’m much better off than many with this condition, who are frequently hospitalized, etc. I’m grateful I can mostly do what I was doing before. Appreciate your kind words. Hi, Melissa. Thank you for sharing this concern with your readers. We will pray that you keep your positive spirit and, when the going gets tough, you keep going! Your spirit, energy, intelligence, humor and friendship are forces for good in this world. So sorry to hear news of your physical constraints and will pray for healing of your body, and continued strength of your spirit and mind. Like you, I find that music can make every day a joyful one – despite limitations. Love to you, Melissa. This b!tch bronchiectasis could not have chosen a tougher, more determined opponent! Thank you for sharing your news and your uplifting outlook regarding this diagnosis. Gratefulness is powerful. Looking forward to seeing you SOON! Haha thank you!! It’s pissed me off, that’s for sure. 😀 Can’t wait to see you! Melissa – I had no idea you were dealing with all this. You are a strong, smart lady that has earned so much respect in our “small world” industry – BTW that’s not “pity party” talk, that’s just truth. We often don’t know what’s going on “in the background” of friends lives who we just assume everything is “hunky dory, when it’s often not the case. So thank you for sharing. Thank you my friend! It is hell getting old, isn’t it? 🙂 The oxygen mask saying is my mantra as well – that’s why I wrote this post. I’ve had to back out of things and got tired of not telling people why. Melissa, I commend you for speaking out about your condition and no, it is NOT a pity party. You enlightened those of us who love and admire you in what you are dealing with on a daily basis. But there is hope. Hope in the advancements in the medical field, new procedures and meds. But most of all there is hope in our mighty Savior who is a God of miracles. He will see you through the bad days and give you joy always!! Love you !!! Hi Melissa. Very sorry to hear the news. I’m a regular reader (although I’m not sure if I’ve ever commented before). There are many more like me I’m sure who appreciate the hard work you put into Beyond the Paid and are wishing you the best. Hopefully the vest and other treatments turn out to be highly effective for you. Thank you so much for your kind words! And thanks for reading.